Let the sun's rays brighten their day thanks to this vibrant bouquet of sweet orange tones. This combination of flowers is perfect for celebrating an anniversary, birthday or any other special day and is composed of red and yellow roses accompanied by gerberas with little white flowers to really highlight the magnificence of the warm colours. 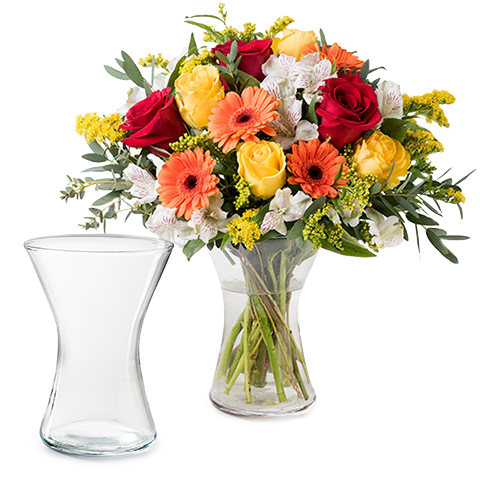 Additionally, the gift includes a transparent vase so that the flowers can show off their beauty from the very moment they arrive. I liked the product a lot and the delivery was nice.